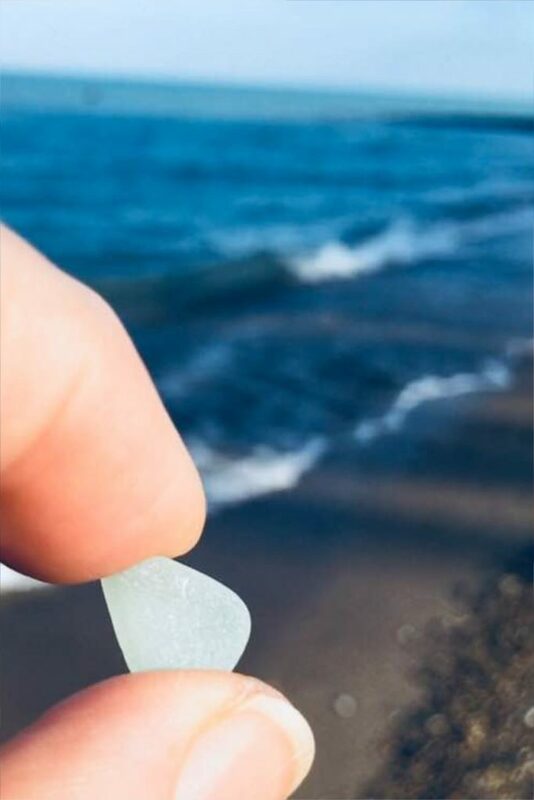 Sea glass, also called beach glass, is any glass that has eventually found its way to a body of water that has a sufficient combination of surf, sand and stone to naturally tumble, smooth, and frost the shard into a genuine gem.” Sea Glass Journal. 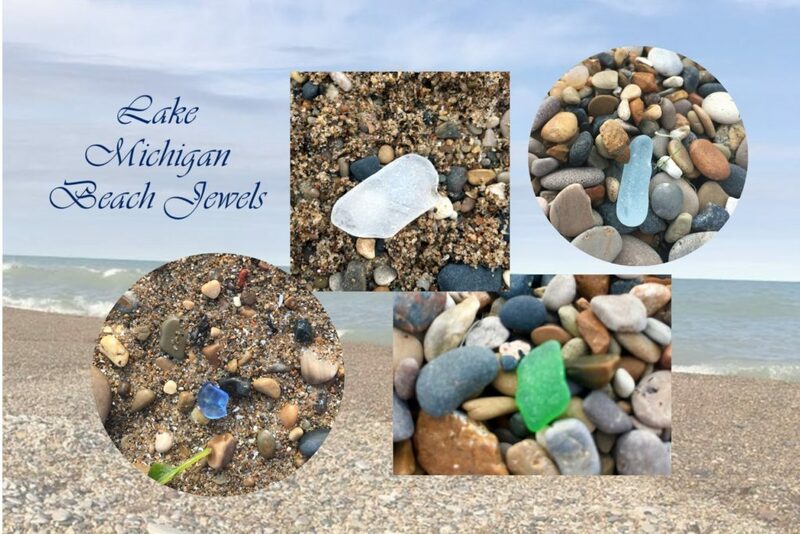 While sea glass is processed by the salt water of the ocean, beach glass is seasoned by the inland lakes and waterways. For me, it’s Lake Michigan. 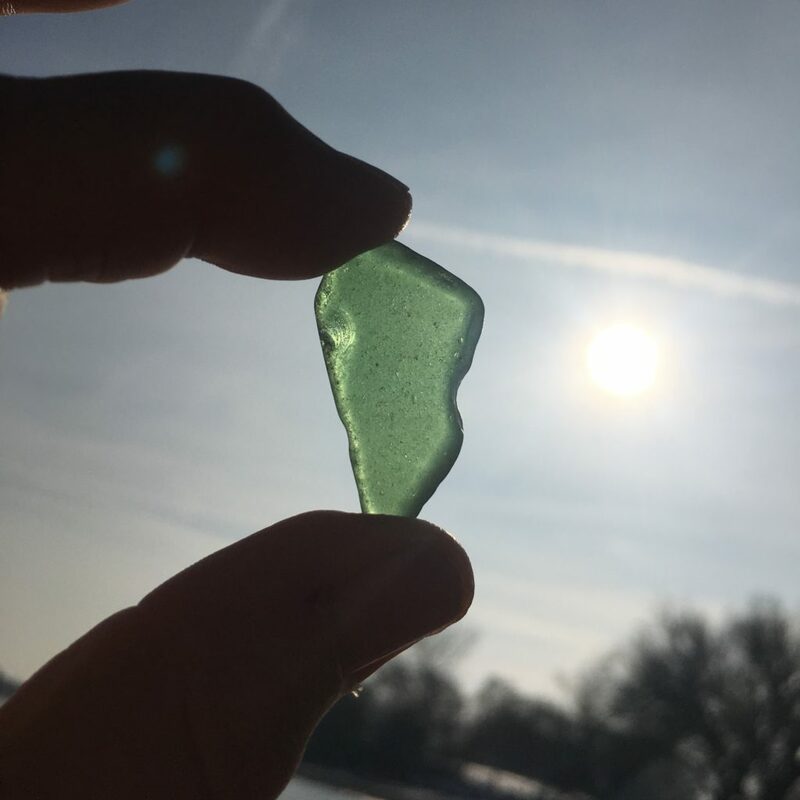 During this past summer, as I strolled the beach at Illinois Beach State Park, I spotted a few beach glass pieces as I stood on the old boat dock, gradually being overtaken by the water level in the lake. 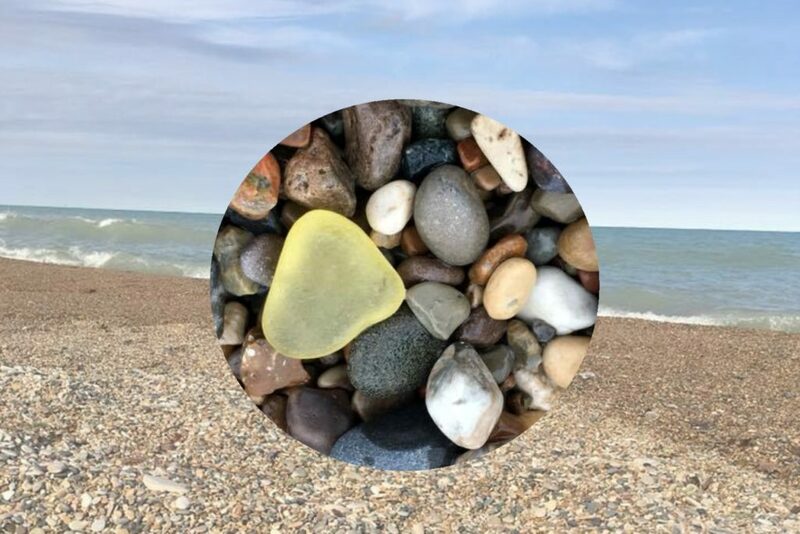 I had heard about beach glass when fellow-blogger Jody Lee Collins shared a photo on Facebook of some sea glass collected by a friend from the ocean a few years ago. Vacationing in Florida at the time, I dismissed it as sweet but just another thing to look for. I was busy collecting seashells. But here I was peering down onto the sand at three small pieces of beach glass staring back at me. I couldn’t resist climbing down from the dock, around the rocks to retrieve them. From that moment, I began looking for it everywhere. You’ll often find me walking along the western beaches of Lake Michigan, looking down a lot, sometimes sitting on a rocky beach digging in the sand like a little kid, hoping to find one of these shards of broken glass, tumbled by the waves, seasoned by forces of nature to appear jewel-like on the beach. 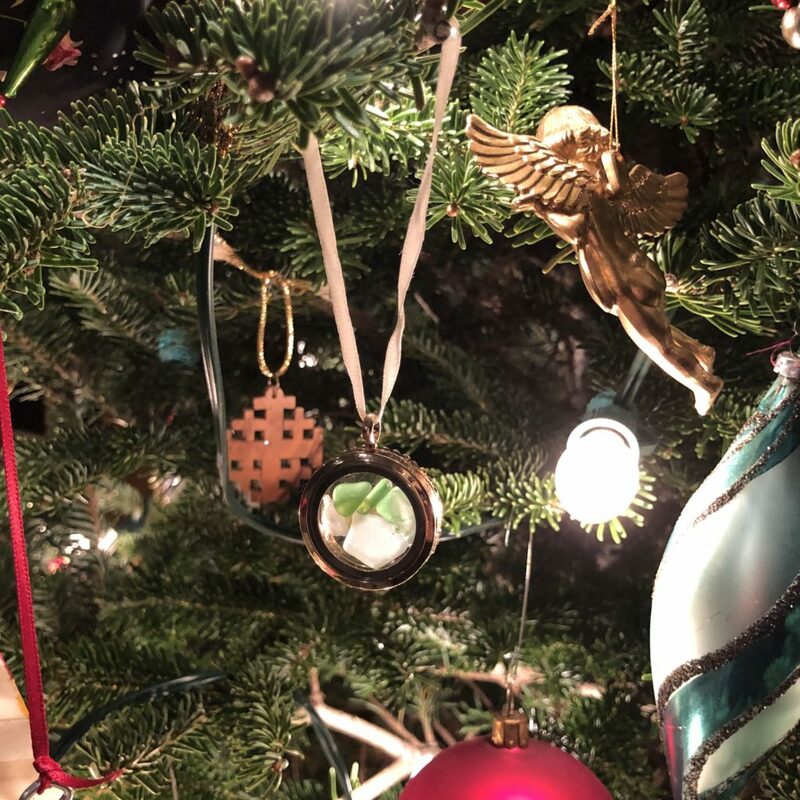 I can’t stop thinking about the words they say to me as items once valued for their beauty and usefulness, and treasured heirlooms displayed with care are. . . .
You may not have much hope or barely hanging onto faith today as you read what I have written. Perhaps you need someone to hold your faith for you. Others do it for me. I’d love to hear from you no matter where you are today. 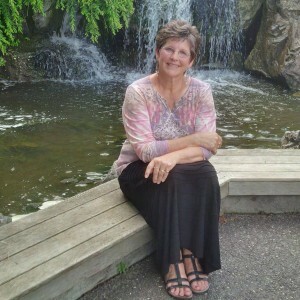 Carol, your post and poetic insights on beach glass have filled my heart this morning. Koen and I (Kyler too) are avid collectors of beach glass at Glencoe Beach. We have made ornaments with ours too, and lined picture frames with them. Each one is so unique and feels like a blessing when you find it. And the meditative process of scouring the sands for them calms the mind and soul. I too have often thought about how it was once just regarded as lost garbage in some ways, and how it transforms into something totally new and beautiful, a reminder that all our experiences in life make us the beautiful reflection of God’s love for us. Thank you for writing this post! A reread of this brought me to a deeper place…truly the work of God in our lives especially thru the tough times is renewing and restoring us. Only God is able to redeem the chaos – making all things new! I am so grateful. To Him be the glory forever and ever!! Beautifully expressed Carol. So glad I met u on Saturday. Carol, this is beautiful. The polishing of beach glass reminds me of the refining process that God sends us through in our lifetimes. We are battered by the trials in our lives and polished to perfection in heaven. The tumbling that we experience draws us closer to Him. Thankfully, our Savior died on that cross and paid for our imperfections. We can then live as jewels in heaven all because of Him. Thanks for sharing the hope of knowing there is meaning, -that someone is honoring either in this life or the next, each of our scrapes and life-shattering events. I’m glad God tumbled this piece of broken glass (me) near yours and get to see how he’s shining in you! Yes, this is what we do for each other … hold out faith, love, hope for each other, when needed most. And oh yes, the sea glass. Beautiful reminder that God takes us with all of our flaws and uses us—to make beauty, to share beauty, and to bring joy to others. good morning – thanks for stopping by, Anita. Where do we get the idea God uses only perfection!? Grateful along with you he does not require that of us! Once again, I am touched by your words…thanks for sharing them. Some time along a beach would bless my soul…and I will now look out for these precious jewels called beach glass. you know me — just give me water. I am grateful for Lake Michigan. Thanks for chiming in here. Merry Christmas and love to you, friend. Thanks Tandi. I think you are new here – at least in the comments section. Welcome! What beautiful beach specimen you are gathering along with insight re. their formation! I hear you Rebecca, and I get it. Remember when we used to think at this point in our lives we’d have no doubts. Our faith would always be strong and it would be easier to trust because we would have seen all God has done. The thing is, we have also seen and experienced the hard things of life, loss that tears at our hearts. We are are more aware of things with no easy answers. Sometimes it feels harder than ever to trust. It’s why we need each other I think.